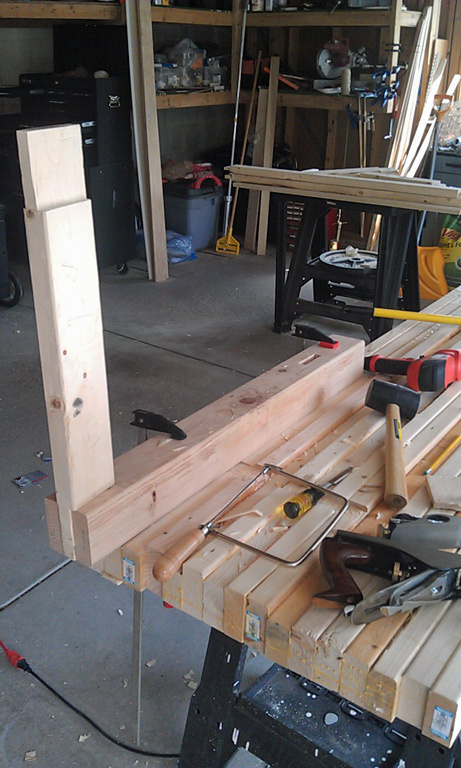 ← Workbench Day 16: Winding sticks and cutting rail tenons. I didn’t have much time in the shop today, but I do what I can, when I can! There was just enough time to cut the first two bridle joints in the legs (I did both the left rear and left front legs). I had put the layout lines on the first one yesterday so I was ready to grab the saw and have at it today. But man, my arm is sore! That 4×4 Douglas Fir is no joke to cut a 3.5 inch by 1 inch chunk out with handsaw and chisels. Not bad…could be better (it always could!) but for the first try not so bad as I thought it would be. No where near what you see online and in books but I’m working on it. I had to cheat a little with this one too. 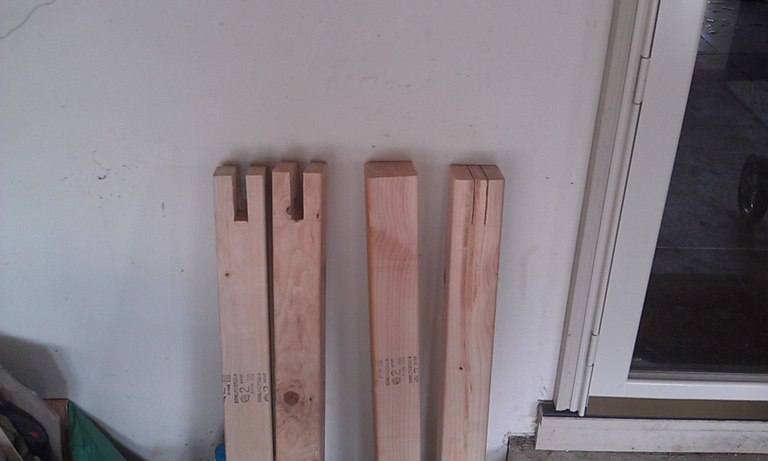 I got the two sides cut all the way back (sort of…the saw was jumping all over the place and I ended up with three kerfs on one side and two on the other) it all cleaned up with a chisel but man it was labor intensive. That still left the middle to be hogged out. I tried my coping saw and everything else for that matter, to no avail. Out comes the Black and Decker Woodwrecker. Chucked in a 1/2″ paddle bit and one long drill and the whole chunk popped right out. I thought to myself, I have a system! So on the next leg I used the hand saw to make the long cuts—this time I’m pleased to report the kerfs went from a 3-2 ratio to a 1-2 ratio. Much cleaner—I took my time and focused on steady strokes, not power. Actually, I had to, my arm was burning from cuttin gthe first one! However, when I tried to run the dril to cut the waste out, it started to wake up the baby—power tools are a big no no with open windows! That’s when I hit on the idea of using a chisel to chop it out. And wouldn’t you know it, 5 minutes later I had a much nicer bridle joint ready to go, with no power tools. Should have thought of that the first time. Even with the drill, it took longer because I had to go back and clean up the mess it left in the wood. Right! On with leg number 3 and a new system. I stepped up and worked on the long cuts again and got everything ready for the chop out when both kids woke up for good. So, time to pack up, clean up and take one picture of the legs as they stand right now. You can see the first cut on the left, the 2nd next to it, the last leg to be cut is next, and the one I cut just before quittin’ time is last on the right. With any luck, I should have these beastly joints cut tomorrow. With my new system, I may have time enough to dry fit everything and drill for the pegs! I can feel assembly just around the corner. That’s why I’m also feeling so frustrated—it feels like the last week has taken longer than the whole project to day because these massive joints just take so much time and energy (and sweat!) to hack out. I hope that means (1) I’m doing it right, and (2) it will be strong. I would assume if I was able to go fast (given my current experience and skill set) it would be wrong and/or structurally weak. This entry was posted in Workbench and tagged bridle joint, chisels, mortise, Saw skills, tenon, workbench. Bookmark the permalink. Almost there. There are some tools that making working with big timbers easier but unless you are going to deal with them all the time, it’s not worth getting the specialized stuff. Just keep slugging away and it will get done.